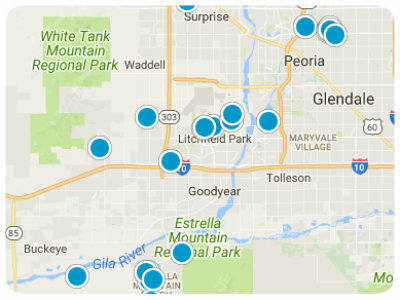 Arrowhead Ranch is a combination of communities in north Glendale, Arizona. It is north and south of the 101 between 51st Avenue and 79th Avenue. The master-planned community was developed in the late 1980s. Five phases to Arrowhead Ranch included Arrowhead Lakes, Arrowhead Ranch, Sierra Verde, Hearthstone, and Highlands at Arrowhead Ranch. Arrowhead Ranch offers beautiful views of the Foothills of Thunderbird Conservation Park. The 1,185-acre park runs along the northern edge of Arrowhead Ranch and offers many opportunities for hiking and biking. Glendale’s Arrowhead Ranch is surrounded by two golf courses, the Legend at Arrowhead and Arrowhead Country Club. Besides the golf at the country club, there are also tennis, fitness equipment, spa services, and swimming available for those looking for some exercise. Another draw for many is the lake that runs through parts of the community. There are always water-based activities to enjoy. Throughout the community, you’ll find parks and greenbelts and plenty of walking trails. As part of Glendale, you’ll find it easy to enjoy the Phoenix Coyotes and the Arizona Cardinals, both located in the Westgate Center. Shoppers can enjoy the Arrowhead Towne Center if they are looking for indoor shopping. There are also smaller shopping areas within the area. Arrowhead Ranch real estate is made up of various types of homes, some situated on waterfront lots and some with picturesque golf course views. Many of the Arrowhead Ranch homes have gorgeous mountain, lake and waterfall views. The community was built in different phases and covers a wide area creating various neighborhoods. 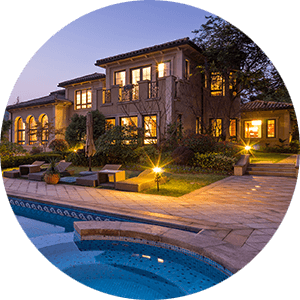 There are many styles of homes, one and two story, various size homes from 2 bedrooms and up, and you will be able to find the right style for you. An additional comfort is knowing that the Arrowhead Hospital is close to and behind the hospital are many doctor’s offices, offering great convenience. Students are served by the Deer Valley School District. The part of Arrowhead Ranch you reside in determines which elementary and higher schools will be attended. 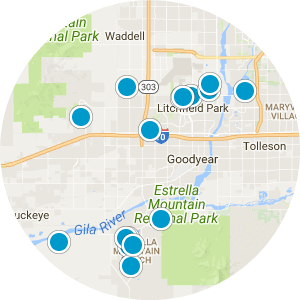 The diverse real estate options, the many amenities, and the beautiful area make this a must-see destination for homebuyers searching in the Phoenix area. 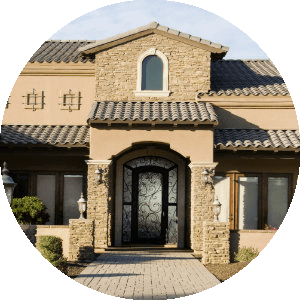 If you would like more information regarding homes for sale in Arrowhead Ranch, Glendale, Arizona, please contact us today and allow us to assist you.